Despite exciting clinical success, resistance to immune checkpoint inhibitors remains a widespread problem, and researchers are always on the hunt for new treatment targets that might improve T cell functionality. In a recent paper published in The Journal of Clinical Investigation, Stanczak and Siddiqui et al. set out to address this problem by exploring the role that Siglecs might play in the activation of tumor-infiltrating T cells. Previous research has shown that in a tumor setting, the binding of sialic acid-binding immunoglobulin-like lectin (Siglec) family members to their ligands, sialoglycans (which serve as “self-associated molecular patterns”, or SAMPs), can lead to the inhibition of natural killer (NK) cell-mediated tumor killing, induce a tumor-associated macrophage phenotype, and promote myeloid cell-mediated cancer progression, overall contributing to immune evasion. However, whether Siglecs are involved in intratumoral T cell activity has not been explored. Therefore, the researchers started out by analyzing immune cells in primary non-small-cell lung cancer (NSCLC) samples for Siglec expression. As expected, Siglecs were expressed on NK cells and myeloid cells. Although Siglec expression is very low in T cells from peripheral blood of healthy donors or non-malignant splenic tissue, several Siglecs were expressed on a significant portion of tumor-infiltrating lymphocytes (TILs), including CD4+ and CD8+ T cells. The expression of Siglec-9 on TILs was most prominent and most consistent across patients, and so the team focused the rest of their analysis on Siglec-9. Elevated levels of Siglec-9 were also observed in TILs from colorectal cancer and epithelial ovarian cancer. Flow cytometry demonstrated that Sig9+CD8+ TILs in NSCLC were Eomeshi and Tbetlo and co-expressed other inhibitory receptors, including PD-1 (usually PD-1hi), TIM-3, and LAG-3. Sig9+CD8+ T cells in general exhibited higher upregulation and co-expression of inhibitory receptors than Sig9-CD8+ TILs in NSCLC. When activated, Sig9+CD8+ TILs expressed significantly higher levels of activation markers (such as CD25 and CD69) compared with Sig9-CD8+ TILs. Although CD8+ TILs were dysfunctional, as indicated by reduced production of IFNγ and TNFα, interestingly, it was easier to reinvigorate the Sig9+CD8+ TILs than Sig9-CD8+ TILs. This may be because Sig9+CD8+ TILs exhibited a higher CD5 and Ki67 expression and lower CD38 and CD101 expression, a pattern that has previously been associated with higher functionality within PD-1hiCD8+ TILs. Overall, the results of Sig9+CD8+ TIL characterization suggest that these cells constitute a distinct subpopulation of tumor-specific CD8+ TILs. To explore the functional role of Siglec-9 on T cells, the researchers utilized the high affinity Siglec ligand LGALS3BP, which is upregulated in NSCLC, and found that it inhibited CD8+ T cell activation. On the other hand, downregulation of sialoglycan-SAMPs (Sia-SAMPs) via knockdown of GNE (an enzyme involved in the production of sialic acid) on tumor cell lines led to higher T cell-mediated killing in a co-culture assay in the presence of a bispecific antibody, with the Sig9+CD8+ TILs showing higher reactivity than Sig9-CD8+ TILs. The team also found that bivalent, agonistic Siglec-9 antibodies inhibited T cell activation in a dose-dependent manner. Meanwhile, a monovalent Fab fragment that inhibited Sia-SAMP-Siglec-9 interactions by interfering with ligand binding led to increased T cell activation. Together these results suggest that the Sia-SAMP-Siglec-9 interactions can be targeted to enhance TIL activation in NSCLC. In order to investigate Siglec-9 interactions in vivo, the team took a look at the murine equivalent (Siglec-E) and found that it was upregulated on CD8+ TILs in mice with various subcutaneous tumors when compared with splenocytes from both tumor-bearing mice and healthy controls. The phenotype of murine SigE+CD8+ TILs was similar to that of the human Sig9+CD8+ TILs. The team then compared the growth of subcutaneous wild-type (WT) and GNE-deficient MC38 colon carcinoma tumors in mice and found that the GNE-KO MC38 tumors, which had a downregulated expression of Sia-SAMPs, exhibited delayed tumor growth. This was also observed in GNE-KO EMT6 breast carcinoma tumors. The GNE-KO MC38 tumors had an elevated infiltration of classical DCs and CD3+, CD8+, and CD4+ T cells. There was no difference in infiltration of other myeloid cells or Tregs. In a separate experiment, MC38 and EMT6 GNE-KO tumor growth was shown to be similar in WT and adaptive immune system-deficient NSG mice, leading the authors to conclude that sialylation directly affected tumor growth. In transgenic mice that selectively expressed human Siglec-9 (which is capable of binding to murine sialylated ligands) on CD4+ and CD8+ T cells, MC38 tumors grew faster and larger compared with controls. These results support the idea that inhibitory Siglecs on T cells are able to mediate tumor evasion. In a separate mouse model, where Siglec-E was engineered to switch from an inhibitory to an activating receptor, MC38 tumors grew slower and smaller, and this effect was dependent on CD4+ and CD8+ T cells. Adoptive transfer experiments further demonstrated that Siglec-E on T cells is functionally involved in immune evasion. Finally, the authors found that NSCLC patients with a high frequency of Sig9+ TILs (>30% of CD8+ T cells) had worse overall survival, although the significance was reduced when age and stage were taken into account. In addition, they observed that certain polymorphisms of Siglec-9 were associated with reduced risk of developing squamous cell lung cancer and colorectal cancer, suggesting that Siglec-9 may play a role in the development of these cancers. Overall, Stanczak and Siddiqui et al. 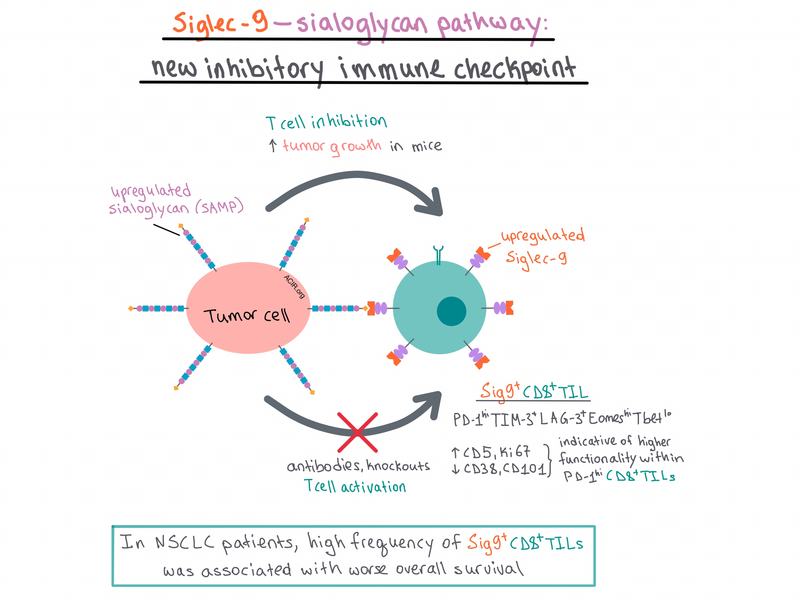 show that the Sia-SAMP:Siglec-9 pathway is a newly defined inhibitory immune checkpoint for T cell activation, and targeting this pathway may improve antitumor response. Stanczak M.A., Siddiqui S.S., Trefny M.P., Thommen D.S., Boligan K.F., von Gunten S., Tzankov A., Tietze L., Lardinois D., Heinzelmann-Schwarz V., von Bergwelt-Baildon M.S., Zhang W., Lenz H.J., Han Y., Amos C.I., Syedbasha M., Egli A., Stenner F., Speiser D.E., Varki A., Zippelius A., Läubli H. Self-associated molecular patterns mediate cancer immune evasion by engaging Siglecs on T cells. J Clin Invest. 2018 Aug 21. Willingham et al. established CPI-444 as a potent and selective small molecule inhibitor of the immunosuppressive adenosine receptor A2AR. In vitro, CPI-444 restored human T cell signaling, activation, and Th1 cytokine (IL-2 and IFNγ) release in the presence of inhibitory adenosine analogs. In mouse tumor models, CPI-444 reduced tumor growth, mediating complete and durable regression in some animals. Combinations with anti-PD-1 or anti-CTLA-4 showed enhanced antitumor efficacy. Treatment with CPI-444 also increased tumor expression of CD73 (plays a role in adenosine production), which may indicate a mechanism of tumor immune escape. Using the pairwise relationships between 28 immune-related genes and clinical outcome data from neuroblastoma patients, Auslander et al. developed IMPRES, an immuno-predictive score for immune checkpoint blockade (ICB)-treated melanoma based on 15 predictive features. IMPRES was validated on nine published datasets of ICB-treated melanoma and its predictive ability was tested on a newly generated dataset. IMPRES captured almost all true responders and misclassified fewer than half of non-responders. High IMPRES scores correlated with improved PFS and OS, outperforming other transcriptome-based predictions. Ochyl et al. developed a simple vaccine of PEGylated nanovesicles formed from the membranes of endogenous tumor cell lysates. PEG-NPs demonstrated efficient trafficking to draining lymph nodes and uptake by APCs. In B16F10 melanoma-bearing mice, PEG-NPs elicited robust antigen-specific CTL responses, slowed tumor growth, and increased survival compared to freeze-thawed (FT) whole tumor cell lysate. Combined with anti-PD-1, PEG-NPs mediated complete tumor regression in 63% of tumor bearing mice (compared to 13% in mice treated with anti-PD-1 +/- FT lysate) and protected all surviving mice from rechallenge. In a genetically engineered mouse model of KRAS-mutant non-small cell lung cancer with p53 deficiency, Adeegbe et al. utilized the BET bromodomain inhibitor JQI (a drug that has been shown to disrupt Tregs) in combination with anti-PD-1. The combination reduced Tregs (including KLRG1-expressing Tregs), reduced PD-1 expression by TILs, increased the activation and effector activity of TILs, increased MHC-I expression on TAMs, promoted a Th1 cytokine signature in the tumor, decreased expression of growth and survival genes by tumor cells, and led to robust and durable antitumor responses and improved overall survival. Using small tumor samples from patients with non-small-cell lung or mismatch repair-deficient colorectal cancer, Dijkstra and Cattaneo et al. created tumor organoids and co-cultured them with autologous PBMCs in order to enrich for tumor-reactive T cells. Tumor-specific CD107a+ or IFNγ+ CD8+ T cells were induced in ~50% of the co-cultures and these cells killed the epithelial tumor organoids. Detection of CD4+ T cell responses was low and confounded by reactivity to the murine matrix in which organoids were cultured. This tumor organoid platform may be used to assess tumor sensitivity and resistance to T cell killing or to provide T cell products on an individual basis. Based on their observations in genetic knockouts that tumors evade both the the innate and adaptive immune system via expression of CD47 (a “don’t eat me” signal) and PD-L1, Liu and Liu et al. created a bispecific anti-PD-L1-SIRPα fusion protein, which preferentially targeted tumor cells, reduced tumor growth, and prolonged survival in a manner dependent on intratumoral CD8+ T cells, IFNα, and dendritic cell-specific cGAS/STING signaling. Combination of anti-PD-L1-SIRPα and doxorubicin (which upregulated calreticulin, an “eat me” signal, on tumor cells) synergized to enhance the antitumor effect.